Jimmy Lake called it a feeding frenzy. Watch one of Washington’s spring practices, and it’s easy to see why. There’s blood in the water on Montlake, and sharks are circling in the secondary. Myles Bryant. Keith Taylor. Elijah Molden. Kyler Gordon. Dominic Hampton. Brandon McKinney. Cam Williams. Alex Cook. In 2018, the since-departed Byron Murphy, Jordan Miller, JoJo McIntosh and Taylor Rapp starred in a secondary that finished eighth in opponent yards per attempt (5.8) and 25th in passing defense (190.1 yards per game). Now there are four starting spots available — two at corner, and two at safety. There’s a limited amount of food and some desperately hungry mouths to feed. So when Washington takes the field Aug. 31, which sharks will fill their bellies? Through five practices in April, the answers are unclear. And the competition is practically unprecedented. “I don’t think we’ve lost both starting safeties and both starting corners (in the same offseason),” Lake, Washington’s defensive coordinator and defensive backs coach, said Wednesday. “So now it’s really like a feeding frenzy. We’ve got two starting corner spots open, two starting safety spots open and then really the nickel if we move the nickel (position around). 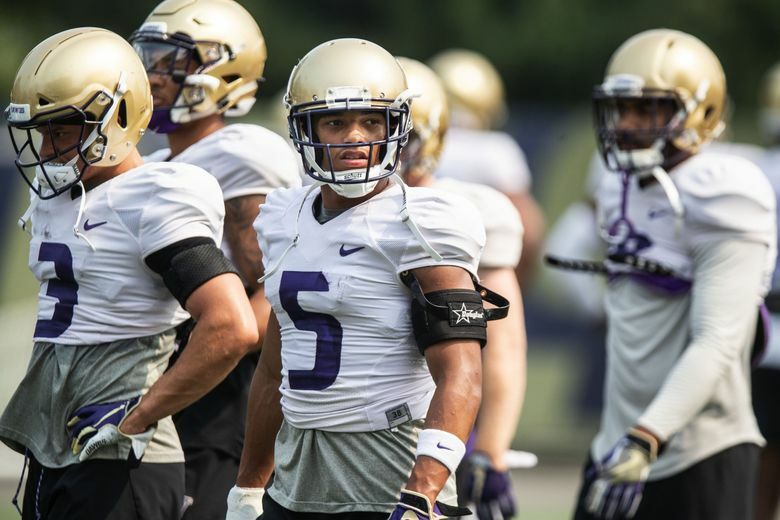 Through five practices, Bryant — Washington’s 5-foot-9, 184-pound senior — has done a little bit of everything. Despite previously starring at nickelback, the Pasadena, Calif., product has spent the past two practices at free safety. Lake won’t say — in the spring, at least — that Bryant is set at that position. Or any position, for that matter. And there’s a flattering precedent for Bryant’s positional flexibility. The same goes for Molden, who has lined up as a starting cornerback and nickelback this spring; and junior Isaiah Gilchrist, who has practiced as a cornerback and a safety (so far). On Washington’s official roster, players are listed only as “defensive backs” — not a nickel, a corner or a safety. And, according to Lake, that absence of specificity is not an accident. “Guys play multiple positions, especially in the back end,” Lake said. “Injuries happen all the time, and we’ve been devastated by injuries. So we’ll always have Plan B, Plan C, Plan D ready to go. On Wednesday, at least, Washington went with Taylor and Gordon as the starting corners, Molden as the starting nickel and Bryant and McKinney as the starting safeties. But you can count on more starting combinations in the final 10 practices of the spring. So yes, that fosters some friendly competition in the secondary. It also forces each former four-star prospect or overlooked walk-on to make the most of their starting reps — regardless of the position. “We’re hungry to learn,” said Molden, who has turned in 48 tackles and six passes defended in his first two seasons, primarily as a nickelback. “Right now you can just tell with people that we’re really focused in. In the past we’ve had people that have been in the secondary, three-year starters or fifth-year seniors. Early in the spring, Lake’s young secondary is still learning. That won’t change when highly touted freshmen Asa Turner, Trent McDuffie and Kamren Fabiculanan join the competition in the fall. There’s blood in the water on Montlake, and it’s almost time to feed. “I came in with the shift from Sid (Jones), Budda (Baker) and Kevin (King) to the guys that are about to go into the draft,” Molden said. “It’s the same deal where people have their doubts.